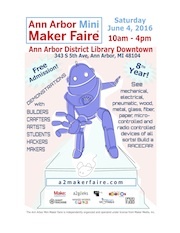 The 8th annual Ann Arbor Mini Maker Faire will be Saturday, June 4 at the Ann Arbor District Library’s Downtown Branch! 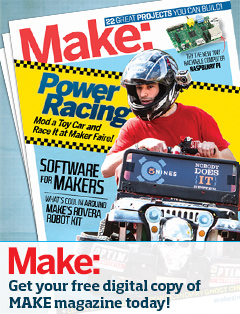 The AADL has organized and hosted a lot of makery things in the past few years including exhibiting at the A2 Mini Maker Faire year after year. Plus, if you haven’t heard yet because you are too busy practicing the theremin you checked out from their instrument collection, they ALSO have a makerspace, the Secret Lab! Exhibitor applications and additional info will be out in the early Spring. So check back for updates. And as always, the faire will be free for attendees and exhibitors. A huge thank you to our sponsors for making it accessible to everyone.